Are PMOs killing the role of the project manager? With the Future PMO Conference coming up in London, I think it is worth considering just how far the role of the PMO should go. I have been involved in the PMO competency development work with the Flashmob team and at times it concerned me that we were in danger of defining the PMO as a monster which inappropriately seizes responsibilities from the project manager. The PMO must be an empowering influence in the project community, not a disempowering one. Earlier this year Richard Hendrickse talked on “Developing PMO Servant Leaders”. Surely this is the style and culture that the PMO must seize if project management and project managers are to remain relevant in our organisations? If you are lucky enough to have attended the PMO conference in London on 13th June 2018 then you may be already be reflecting on: How could the PMO improve? How can we increase the value of our PMO? What kind of PMO should we be? A view that PMOs should not be permanent structures has gained ground recently. 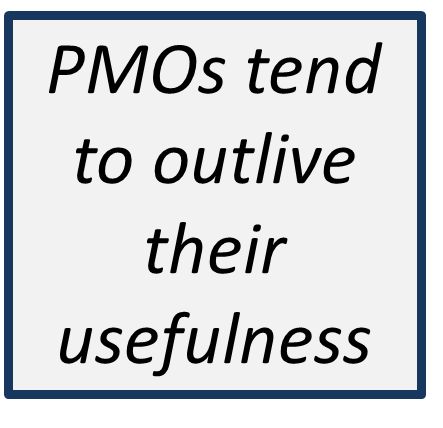 Todd Williams, in his insightful book on “Filling Executive Gaps”, suggests that PMOs are perceived as essentially bureaucratic and they all tend to outlive their usefulness. The need to re-invent and re-align the PMO every few years to remain valuable has almost become a mantra in PMO circles. Stakeholder engagement is one of the most important factors in the successful delivery of projects. On 24th February 2017, the Cape Town PMO forum hosted by PwC deliberated over what role the PMO should play in promoting good stakeholder engagement on projects. We were conscious that there is a fine line between the PMO facilitating good practices; acting as a broker between the project and its stakeholders; and taking on the role of leader in stakeholder engagement. The more responsibility the PMO takes, the higher the risk that it disempowers the project and threatens the creation of effective project-stakeholder relationships. That said – it is clear the PMO has the potential to support and encourage good stakeholder engagement practices. How to get the balance right?